The Lede provides updates on the protests in Egypt on Friday, 18 days into the standoff between pro-democracy protesters and the Mubarak regime. Pro-democracy campaigners march on state television and presidential palaces, as army calls for normal life to resume. CAIRO, Feb 11 (Reuters) - The Muslim Brotherhood, Egypt's largest opposition group, urged Egyptians on Friday to stay on the streets to oust President Hosni Mubarak from power, calling the veteran ruler's latest speech a trick. "Mubarak appeared before us with a stinging speech that proves that he is still in charge. He still says he will do this and do that but will delegate authority to his deputy. But it's just more deceptive words to stop the people's demands," the Islamist movement said in a statement. Demonstrators coalesce around the state TV and radio building and a few hundred protesters engage in a standoff with Mubarak loyalists outside the presidential palace in Heliopolis. The army vows to uphold Mubarak's promises of reform. Protesters fanned out to shut off key government buildings in Cairo on Friday as the Egyptian army, under pressure from all sides, issued a statement pledging to guarantee President Hosni Mubarak's promise to lift emergency law and ensure free elections. 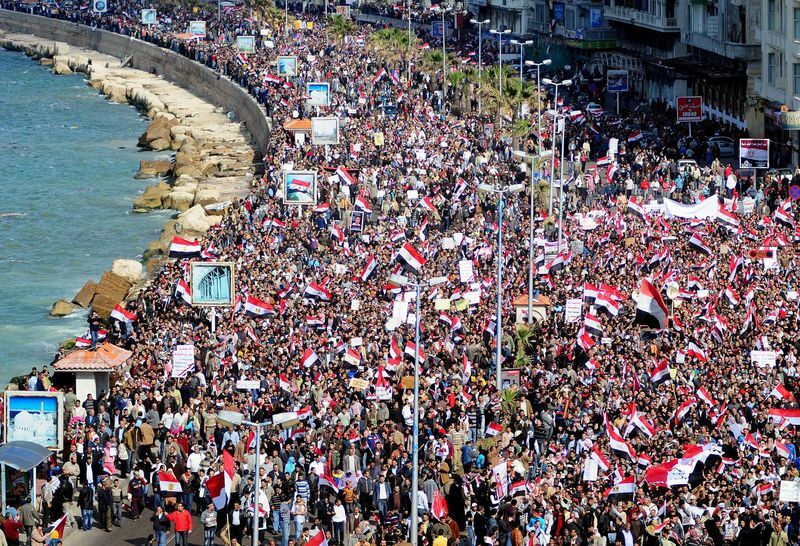 Throngs of pro-democracy protesters, whose hopes to oust Mubarak were dashed, are expected to march on streets en masse. On the afternoon of Thursday, February 11, rumors flew that Egyptian president Hosni Mubarak, in power now for 30 years, planned on resigning - a step that would fulfill the hopes of protesters who have occupied central Cairo's Tahrir Square for 17 days. Instead, late on Thursday night, Mubarak delivered a meandering, 15-minute speech in which he delegated powers to his vice president but refused to resign. The crowd reacted with anger, and protesters vowed to redouble their efforts. CAIRO, Feb 11 (Reuters) - Here are quotes from Egyptians demonstrating at Cairo's Tahrir Square, presidential palace and outside the state television building on Friday, as well as reaction from protest figures and social networking sites. Al Jazeera's Andrew Simmons has tested the mood among the crowd in Tahrir Square. Protesters say president Mubarak is not listening to the growing anger. More than 100,000 Egyptian protesters gathered in Tahrir Square to celebrate what they believed would be President Mubarak's resignation. Instead, his defiant televised speech left many angry or in tears. Protesters celebrate after a general says their demands will be met. Then Mubarak refuses to step down. President Hosni Mubarak's face glared down from a giant screen that rippled in the cold breeze above Tahrir Square. His gravelly voice boomed across a multitude of protesters standing silently, standing in shock, but most important, still standing. "No one is going to go against our desire. We are getting back our country," Wael Ghonim declared on CNN last night, and today the 30-year-old Google executive is arguably the most powerful man in Egypt. Ghonim's spectacular interview on Egyptian TV Monday night hours after he was freed from 11 days of imprisonment spurred the revolution to new heights and stirred the White House (as David Gergen said on CNN). CAIRO (IPS) - Over recent years, Egypt has witnessed mounting tension between its Muslim majority and its sizeable Coptic Christian minority. But in Cairo's Tahrir Square, the site of ongoing mass protests against the ruling regime, members of both faiths chant in unison "Muslim, Christian, doesn't matter; We're all in this boat together!" The disappointment felt by Egyptians is matched only by their determination to fight on against Mubarak. The cool breeze in the air is not capable of calming the flames of anger that Mubarak's speech ignited last night. I was in Tahrir square with hundreds of thousands of people. The square has never before been that busy at night. People of every age and background were flooding the place all afternoon and evening when they heard that the president was going to address the nation. You could sense the excitement and feel the elation as you walked next to people discussing all the possible scenarios after the president stepped down. Many impromptu parties were being formed, with drumming, dancing and chanting. The Egyptians would be free of the dictator who ruled and corrupted Egypt for 30 years. TV and radio stations had been announcing the charges against many of the symbols of the system; previous ministers and ruling party officials were going to be tried for their crimes and corruption. ISMAILIA, Egypt, Feb 11 (Reuters) - Around 1,000 Egyptians attacked a police station in the north Sinai town of el-Arish on Friday to try to free prisoners, exchanging gunfire with police who retreated to the roof, witnesses said. The attackers set ablaze three vehicles outside and hurled petrol bombs during confrontation. CAIRO, Feb 10 (Reuters) - Unidentified assailants attacked security force barracks in the Egyptian border town of Rafah on Thursday, security sources and eyewitnesses said. The attackers opened fire with guns and used rocket-propelled grenades, the sources said. Rafah is near Egypt's border with the Gaza Strip. CAIRO, Feb 11 (Reuters) - Al Arabiya television reported on Friday that President Hosni Mubarak and his family had left Cairo from a military airbase in the suburbs and had travelled to the Red Sea resort of Sharm el-Sheikh. The Egyptian military appeared to assert its leadership Friday amid growing indications that President Hosni Mubarak was yielding all power. Military says emergency law, in place for decades, will be lifted "as soon as current circumstances end". Hosni Mubarak gets backing of Egypt's military: Who's really in charge? Hosni Mubarak's refusal to step down after a day of signals that he was leaving power is pushing Egypt's uprising toward a dangerous confrontation. Egypt's military appears to be firmly backing the regime. Egypt's most prominent dissident warned in a tweet Thursday night that the country "will explode" and appealed to the army for help. "Egypt will explode. Army must save the country now," Mohamed ElBaradei, the former head of the nuclear watchdog IAEA, tweeted. His warning of violence came minutes after President Hosni Mubarak declared in a speech that he would not step down as president until the September elections. Reporters at Cairo's Tahrir Square said the crowds there were angrier than they had seen them since protests broke out on Jan. 25. WASHINGTON — Leading Egyptian dissident Mohamed ElBaradei proposed Thursday that a three-person national unity government succeed President Hosni Mubarak and his deputy, and steer Egypt to democracy. In an interview with Foreign Policy Magazine, ElBaradei said the US-backed transition process led by Vice President Omar Suleiman will fail to take the country to democracy unless "we keep kicking their behinds." Hosni Mubarak gave a speech in which he was anticipated to announce his resignation. Instead, the 82-year-old Egyptian president repeated his intention to remain in power until the presidential elections in September. President Hosni Mubarak provoked rage on Egypt's streets when he said he would hand powers to his deputy but disappointed protesters who had been expecting him to step down altogether after two weeks of unrest. "Leave! Leave!" chanted thousands who had gathered in Cairo's Tahrir Square in anticipation that a televised speech would be the moment their demands for an end to Mubarak's 30 years of authoritarian, one-man rule were met. Instead, the 82-year-old former general portrayed himself as a patriot overseeing an orderly transition until elections in September. He praised the young people who have stunned the Arab world with unprecedented demonstrations, offering constitutional change and a bigger role for Omar Suleiman, the vice president. Hosni Mubarak disappointed and enraged pro-democracy protesters when he did not announce he would quit as many expected. Some Egyptian protesters amassed in Cairo’s Tahrir Square fear Mubarak’s regime is just trying to buy time. Egyptian president vows he will stay in office until September, and will not bow down to 'foreign pressure'. Amid rapidly changing developments in Egypt and conflicting reports about the nature of power transition, questions about the location of embattled President Hosni Mubarak are taking center stage in different local and international news media. A general tells protesters in Cairo's Tahrir Square that their demands will be met, and the military says it is taking the 'necessary measures to protect the nation and support the legitimate demands of the people.' Protesters have been adamant that Hosni Mubarak step down. Egyptian President Hosni Mubarak is expected to address his nation within hours following an announcement Thursday from a general to thousands of protesters in Cairo's Tahrir Square that their demands would be met. CAIRO, Feb 10 (Reuters) - A military coup? A triumph for people power? Egyptians watching as President Hosni Mubarak's 30-year rule disintegrated on Thursday could not be sure. When a grim-faced military spokesman appeared on television to read "Communique No. 1" announcing that the army's higher council was in continuous session -- in Mubarak's conspicuous absence -- it looked like a classic military takeover. CAIRO, Feb 10 (Reuters) - Comments by Egypt's Vice President Omar Suleiman to U.S. television stations suggesting Egyptians were not yet ready for democracy were taken out of context, the state news agency MENA said on Thursday. Mubarak appointed Suleiman as his deputy after massive protests erupted from Jan. 25 against poverty, corruption and political repression. In one of the largest protests yet, Egyptians loudly rejected the government’s approach to change. WASHINGTON — Bristling with impatience, President Barack Obama on Thursday openly and sharply questioned whether Egyptian President Hosni Mubarak's pledge to shift power to his vice president is an "immediate, meaningful or sufficient" sign of reform for a country in upheaval. The Egyptian people have been told that there was a transition of authority, but it is not yet clear that this transition is immediate, meaningful or sufficient. Too many Egyptians remain unconvinced that the government is serious about a genuine transition to democracy, and it is the responsibility of the government to speak clearly to the Egyptian people and the world. The Egyptian government must put forward a credible, concrete and unequivocal path toward genuine democracy, and they have not yet seized that opportunity. The Obama administration has gone silent following the latest speech by Egyptian President Hosni Mubarak, in which he seemed to cede some powers to Vice President Omar Suleiman but refused to step down from office. "We don't have any immediate comment," National Security Spokesman Tommy Vietor told The Cable. Follow-up requests for information about how the White House was processing the latest news from Cairo went unreturned. The State Department cancelled its daily press briefing and State Department spokesman P.J. Crowley's latest tweet on the matter was several hours ago. The Obama administration struggled Thursday to keep pace with events in Egypt and retool its strategy there after a defiant President Hosni Mubarak lashed out at what he described as foreign intervention. Egyptian leader's speech reiterating that he won't quit as widely expected fails to reassure his people and the world. Reaction in the Middle East to President Mubarak's defiant address to the nation was muted late yesterday, with nervous regional leaders hesitant to prejudge the outcome of fast-moving developments in Egypt. WASHINGTON (AFP) -- US Senator John McCain on Thursday condemned Egyptian President Hosni Mubarak's "deeply unfortunate and troubling" refusal to step down immediately and urged him to heed his people's calls to quit power. NEW YORK (AFP) -- German Foreign Minister Guido Westerwelle on Thursday said Egyptian President Hosni Mubarak's speech "was not the hoped for step foward." Egyptian VP said he will "take care of" Gaza, stop Hamas from gaining control, in meeting with Israeli official. The Middle East Monitor has followed every step of the Egyptian revolution ever since it erupted on 25 January 2011. Our staff have scrutinised very closely the media coverage of the events in Tahrir Square in Cairo and in other towns and cities across the country. Hardly a commentary or analysis has been written without reference to the Muslim Brotherhood. Its past, present and future roles in Egyptian politics have been subjected to serious examination, although many of the commentaries are littered with speculation and unfounded claims. The State Department confirmed on Thursday that Khairy Ramadan Aly, an Egyptian national who worked as a carpenter at the U.S. embassy in Cairo for 18 years, is dead. He went missing amid the protests on Jan. 28. "On behalf of all the men and women of the State Department and USAID, I offer our condolences to the friends and loved ones of Khairy Ramadan Aly, a member of our Embassy family in Cairo," Secretary of State Hillary Clinton said in a statement. "Throughout this period, many Egyptian employees of the U.S. Mission have continued to work alongside their American colleagues in Cairo and Alexandria. The United States is grateful for their contributions, commitment and sacrifice during this difficult time." Amnesty International accuses Egyptian political leaders of acting irresponsibly after they failed to initiate any human rights reforms during key speeches by President Hosni Mubarak and Vice President Omar Suleiman on Thursday. Authorities urged to end 30 years of repressive emergency rule and allow ordinary Egyptians to fully participate in shaping the country's future. CAIRO, Feb 10 (Reuters) - Egypt's uprising has alarmed business executives who fear they will be made scapegoats to appease protesters who want to bring down President Hosni Mubarak and the moneyed elite around him. The upheaval that has gripped Egypt since Jan. 25 has targeted links between Mubarak's government and a privileged class of loyalist business executives who have grown rich under privatisation and other economic reforms. Baghdad government says Iraq nationals can fly home to escape political turmoil or receive food and monetary aid. Iraq has offered food, financial aid and free flights home to its citizens who had moved to Egypt to escape civil strife at home but may now feel threatened by unrest in their host country, officials said. The Iraqi government has helped some 2,000 Iraqis leave Egypt since the outbreak of a popular uprising against the Egyptian president, Hosni Mubarak, on 25 January. Those deciding to stay in Egypt were offered food and financial aid, said Saif Sabah, a spokesman for Iraq's migration and displacement ministry. Emergency demonstrations in solidarity with the people of Egypt! In a speech that shocked the people of Egypt, Hosni Mubarak has refused to resign after 17 days of protest calling for an end to his dictatorship. In the coming days, people in the United States take to the streets throughout the country in solidarity with the strugle of the people of Egypt. Click here for a list of upcoming demonstrations—please check back as this page will be regularly updated with additional actions. Click here to read an important analysis of the latest developments in Egypt, including Mubarak's announcement that he will not resign and the implications for the mass popular movement. Praise be to Allah the Lord of the world. Peace be on our Master and Prophet Abi Al Qassem Mohammad and on his chaste Household, chosen companions and on all prophets and messengers. Peace be upon you and Allah's mercy and blessings. We meet today with a clear-cut aim. We gather here to express our solidarity stand with the Egyptian people and youth as well as with the Tunisian people and youth. However before tackling some important points – and I am very cautious not to take much of your time and to reiterate what the dear speakers had already said as they were great in all what they said - I would like first to address the Tunisian people and now the Egyptian people with an apology for being a few day late in holding this rally. It's not that we were hesitant of doubtful or needed more contemplation – as we are parties which have this long history in resisting the US-Israeli project in Lebanon and the region and we can't stand on the hill when the struggle is between righteousness and oppression and between the oppressor and the oppressed. We were rather cautious that you won't be accused as you are accused now. This is what called on us to take a few days. RAFAH, occupied Gaza Strip (IPS) - Mustapha Suleiman, 27, from J Block east of the Rafah crossing with Egypt, crosses through gaps in the iron fence on the border carrying bread, water, cans of meat and a handful of vegetables for Egyptian soldiers stationed on the other side. "Whatever you offer on Saturday you will receive on Sunday," Suleiman says. "I am ready to help with what I have, for all the work they do." Egyptian troops have run short of essential supplies, caught up in clashes involving Bedouin groups. Serious clashes have erupted between riot police and Bedouin groups over the past two weeks. The Lebanese have been glued to television coverage of Egypt's protests, but so far there has been more talk than action as a result, reports Lucy Fielder from Beirut Until a wave of people power swept Tunisia and then Egypt, Lebanon was seen as the Arab world's reigning champion for street protests.
" I Am Egypt " video.. in support to all egyptians who had lost their lives in the unfolding events of the 25th of January 2011 Revolution. In record time, filmmaker, social activist, journalist, all-around-badass Hena Ashraf produces a video exhibiting the scores of cross-cultural support by New Yorkers for the Egyptian people's pro-democracy protests. Egypt is big news everywhere these days; while it’s little surprise to see the world laying down support, it’s no longer just the masses, but the celebs as well. On Twitter, celebrities share their support, news items, and, well, occasionally use the Egyptian people’s uprising to capitalize on their own fame. "...Israeli lawmaker Benjamin Ben-Eliezer — who spoke with the Egyptian president by phone on Thursday before his speech — described Mubarak as "different from what I heard on the news. .... He sounded very strong and defiant, .... He analyzed the situation properly and tried to predict the future of the Middle East." In Saudi Arabia, officials have offered Mubarak a place to live, but have advised him not to leave, an Arab diplomatic source told CNN. Saudi Arabia has denounced the "flagrant interference of some countries" in the internal affairs of Egypt, ...(says) Saud al Faisal..."
JERUSALEM - Egyptian President Hosni Mubarak's late-night announcement that he would not quit was met Friday with little or no official reaction throughout the region as leaders cautiously awaited another day of protests in Cairo and continued to try to gauge what impact the political stalemate in Egypt would have on their own rule. The Egyptian president 'wants to end it on his feet and not on his knees,' a former Israeli defense minister says. Hosni Mubarak realizes he must step down and is looking for an honorable way out, a former Israeli Cabinet minister who has long known Egypt's embattled leader said Friday. Outgoing army chief says last days of his term dedicated to security issues, helping his replacement Benny Gantz. U.S. officials meeting Barak stress administration's 'unshakeable' commitment; Israeli envoy: Foreign aid to Israel can't be taken for granted. Reuters - Israeli Defense Minister Ehud Barak said on Thursday the world should encourage change in Egypt but give the country enough time to prevent it from falling into the hands of "extremists." Despite Palestinian Authority (PA) officials banning anti-Mubarak demonstrations, hundreds rallied in support. On February 5, Jerusalem Post writer Khaled Abu Toameh headlined, "100s demonstrate in Ramallah in support of Egyptians," saying: Marching in Ramallah with Egyptian flags, they publicly supported them "(f)or the first time since the beginning of the(ir( uprising...." Another Ramallah demonstration followed as well as a Bethlehem one. Toameh's February 2 article was in stark contrast headlined, "PA launches pro-Mubarak demonstration in Ramallah," denouncing Mohamed ElBaradei as a "CIA agent." Think about it: the panic and fear that is gripping Israel. Its temporary security is purely based on 1) US support; 2) the preservation of pro-US dictatorships that provide Israel with support and security. Now let us say factor one stays for a long time, factor 2 is very temporary. PS Will we meet in Davos any time in the future? The Communique Number Two by the Egyptian Military High Command makes it clear: it is part and parcel with the regime of Mubarak, and they are closely working with Israel/US/Saudi Arabia to prolong the life of the regime. I strongly disagree with comrade Azmi Bisharah today that it was a good communique and that it should reassure demonstrators. It is an American-made communique: the US would not let a military coup in Egypt: and i don't buy the news and stories (I even posted one yesterday) about a discussion of a coup among the top generals. The US fear that a coup would set a precedent and may pose a threat to its future puppets. All that said, the momentum of the people is just incredible. I spoke on Aljazeera Arabic last night (early morning Middle East time) and I did not have time to alert you. I wanted to make it clear that I don't buy the stories that Obama was "shocked" that Mubarak did not step down when he never once has publicly asked him to step down. Who are you fooling, Obama? In this crisis, don't look for top corrupt generals to save the day: look for defections in the lower ranks and dramatic statements and proclamations. Nasser and his top "Free Officers" were not top generals, remember. Arab regimes are now more terrified than ever of Aljazeera and its powers. Yesterday, Prince Saud Faysal made expansive remarks about Egypt (in defense of Mubarak of course) and talked in vague terms about manipulation and exploitation (just as UAE's Abdullah bin Zayid did days earlier) but did not dare to utter the word "aljazeera" once. They are now so scared of it. Nile sate went back on carrying the channel. Al-Arabiyyah (news station of King Fahd's brother-in-law) sank deeper in oblivion during the crisis. Al-Hurra, while no one watches it, will be mocked and remembered for its false rumors that it has been spreading (yesterday, they located Mubarak in Dubai). A most reliable source sent me this: "According to one of his advisers, Samir Geagea told his supporters today that Omar Suleiman was a stalwart ally and a " 'Oudou Charaf" (honorary member) in the LF." Do you see how many palaces Sadat and Mubarak have all over Egypt? More luxurious than Saddam's palaces which were the target of an American media obsession. Many of the palaces are inherited from King Faruq's time: I visited the `Abdin Palace as a child in Cairo and I remember how impressed my siblings and I were with the bath tub of Mr. Faruq. Of course, Nasser never occupied any of those palaces as a matter of principle. Sadat reversed that and he and his wife alledgedly helped themselves to the valuable pieces in them. The Egyptian billionaire, Najib Sawiris, is speaking on Al-Arabiyyah TV (news station of King Fahd's brother-in-law). He is one of the "Wise Men"--self-appointed and self-designated. He called on people in Tahrir Square to respond favorably to the speech by Mubarak. All the billionaires in the Square cheered Mr. Sawiris, and the rest ignored him. This speech will go down in history as the dumbest speech ever delivered by a dictator. It is fair to assume that Netanyaho and his ministers are either fainting or throwing up (or both) as we speak. A most reliable source sent me this: "D.C is striving to transfer the president's power to omri shlomo [`umar sulayman]. anan & most senior officers are against. only the commanders of the air force & republican guard are [in favor]. tantawi is in the middle. anan will win"
I strongly suggest that a highway be constructed inside the Gaza tunnels to facilitate movement. He is packing all the Israeli flags in Egypt in his suitcase. He would need them in his retirement to wipe his tears. I am so thrilled that Mubarak was so humiliated in his ouster. I mean, if he was ousted back on Jan. 25th, it would not have been the same humiliation. He got to watch for days and days the hatred and detestation by the Egyptian people. Today, is the down fall of the Sadat-Mubarak regime. Make no mistake about it. Aljazeera TV has reported that staff of the Egyptian Mubarak TV has fled the building. How will that meeting go? Will there be tears? How emotional will it be? Will Jamal Mubarak bond with the children of Bin `Ali? I wonder. I am receiving information that Mubarak is off to Bahrain. That would be cool: a revolt against the Baharaini government would await him there. ha. entire Middle East within their grasps only so recently. I remember seeing no way out except for an internal or external conflict with Saudi Arabia itself." All the liberal intellectuals of Egypt where solidly aligned with the Mubarak dictatorship, and served as his most loyal propagandists. Do you think that the Egyptian people will forget that? I call on my Egyptian comrades and friends to assemble an anthology of shame in which they collect all the pro-Mubarak utterances and articles and speeches made by Egyptian writers, journalists, and intellectuals. "As Israel faces what many fear could turn into its most serious national security threat in decades, fault lines are widening over how it should respond and some critics say the government appears ill prepared. The mounting pressure to force out Egyptian President Hosni Mubarak, who is widely seen as Israel's most predictable Arab ally, and the uncertainty about what sort of government might replace his is fueling anxiety and debate here over Israel's next move. "This whole situation is making Israel's hawks more hawkish and the doves more dovish," said Yossi Alpher, a former government peace talks advisor and co-editor of Bitterlemons.org, a Mideast political research firm." Eyewitnesses in occupied Palestine report to me that there are rivers of tears all over Israel due to non-stop sobbing by Israelis. Their puppet is gone. More on this developing story. The Israeli cabinet met and issued a stern statement. Let me translate from Hebrew: booo hooo hoo boo hoo hoo. Guess: who is more likely to have Iftar in Cairo next Ramadan? Netanyaho (as he did at the invitation of Mubarak last Ramadan) or Isma`il Haniyyah? I mean, Zionists like Thomas Friedman are insistent that there are no foreign policy goals of the protesters. So since the Israeli government is in deep mourning over the departure of Mubarak, I suggest that Netyanyaho should fly to Cairo to show respect for his dear puppet, Mubarak. Wait: do you think that the Egyptian protesters would welcome Netanyaho warmly? I mean, Thomas Friedman said that they really don't mind Mubarak's foreign policies. So why not try it? I think that Netanyaho should even enter the Tahrir Square on a camel (provided the camel is placed in body armor for his protection). Oh, yeah. "Defense Minister Ehud Barak on Wednesday stressed the importance of U.S. support for Israeli security in light of the political unrest in Egypt, while Ambassador Michael Oren urged the Obama administration to reaffirm its commitment to that regard." "Typically frank, MOD Political-Military Chief Amos Gilad was not certain how much longer Egyptian President Mubarak would live, and questioned whether his son Gamal was ready to assume command. Gilad said the Egyptia military led by Defense Minister Tantawi continues to train and exercise as if "Israel was its only enemy." He added that there were disturbing signs on the Egyptian streets, as women are dressed more conservatively, and that peace with Israel "is too thin, too superficial." "The other camp includes Dennis Ross, a former Middle East peace negotiator for Presidents George H.W. Bush and Bill Clinton. Ross, who has strong ties to Israel, is the author of a 2007 book that advised against treating the Muslim Brotherhood as a potential partner in Egypt's political future, noting the group's refusal to renounce violence "as a tool of other Islamists." Apart from managing the crisis, the White House is consulting with outside interest groups and foreign governments to ensure that its message is getting through. National Security Council member Daniel Shapiro has sought to reassure pro-Israel groups that the inclusion of the Muslim Brotherhood in Egypt's political negotiations would not undermine the country's peace treaty with Israel, according to people who have talked with him. Shapiro, who led outreach to Jewish voters in Obama's presidential campaign, has tended to the president's relations with Israel and other regional partners, as well as with Jewish leaders in the U.S."
"Israelis are bracing for a more adversarial regime in Egypt, one they expect could lead their country to expand its army, fortify the two countries' desert frontier and possibly re-invade the Palestinian-ruled Gaza Strip. Three decades after Israel settled into a "cold peace" with Egypt—breaking its encirclement by hostile Arab states but failing to win much popular sympathy from Egyptians—Israeli officials are reviewing the ways the U.S.-backed transition in Cairo could affect the Jewish state." An ad just appeared in Al-Ahram. The apartment in which the Israeli embassy in Cairo is located is now up for sale. But it requires weeks of cleaning from Zionism. "For years we've been told that Israel is the only democracy in the Middle East. What we weren't told is that Western leaders, including Harper, have been trying to keep it that way." "It was reported last night that King Abdullah of Saudi Arabia contacted the White House last week over concerns about changing the regime in Egypt. Saudi Arabia was warning that it would bankroll Egypt if the US withdrew its aid programme worth $1.5bn annually. "Mubarak and King Abdullah are not just allies, they are close friends, and the King is not about to see his friend cast aside and humiliated," a senior source in the Saudi capital told The Times." Dalia sent me this with this comment: "the west can’t decide whether we don’t remember the names of our dead, or if we wallow in a culture of death." Here is the piece in the LA times: "Protest leaders increasingly are using such victims, whom they call "martyrs to the revolution," and their grieving mothers, to keep passions stoked as Egypt's tumult enters a third week. Anonymous in life, but venerated nationally in death, the victims serve as reminders of government brutality and rallying cries for each new protest and parade. Huge photos of several of the slain — some bloodied and bruised, their wounds displayed in grisly detail — adorn fences around the square. Smaller photos were carried like religious icons in grim processions through the throngs Wednesday. The chanting crowd hailed the victims as martyrs, a potent symbol for the mostly-Muslim protesters, and praised their mothers for their sacrifice." Robert Fisk: As Mubarak clings on... What now for Egypt? To the horror of Egyptians and the world, President Hosni Mubarak – haggard and apparently disoriented – appeared on state television last night to refuse every demand of his opponents by staying in power for at least another five months. The Egyptian army, which had already initiated a virtual coup d'état, was nonplussed by the President's speech which had been widely advertised – by both his friends and his enemies – as a farewell address after 30 years of dictatorship. The vast crowds in Tahrir Square were almost insane with anger and resentment. With today's technology, every person on the street with a cell phone can be a reporter and the entire world can bear witness almost in real time to what happens in the dark alleyways and secret corners of a police state. Yet even this has its risks. I have just listened to Mubarak addressing the Egyptian nation on al-Jazeera. Since this morning there were plenty of rumors that the guy would finally quit. Al-Jazeera showed amazing images. On the left side of the screen, Mubarak was listing all his (assumed) qualities. On the right the people at Tahrir square (fully packed) were screaming from the top of their lungs "he shall leave!". And then, finally, Mubarak announced that he is transferring his powers to his Vice-President Suleiman and then he announced that he was staying until September?!?! 'Just listen to that roar,' urged a CNN correspondent in Egypt, as thousands of Egyptian protesters charged, fists pumped, against hundreds of armed Egyptian security forces. What a roar it was, indeed. The protests have shown the world that Arabs are capable of much more than merely being pitiable statistics of unemployment and illiteracy, or powerless subjects of ‘moderate’ but ‘strong’ leaders (an acronym for friendly dictators). It's not Facebook, or Twitter, or the Muslim Brotherhood, or the middle class, or Iran, Hezbollah, Hamas, the CIA, Mossad, Saudi, the PA, Timbuktu OR the illuminati! Read the signs - aren't there enough? This uprising has one single goal - the removal of Mubarak and his regime, and nothing less than that. Mubarak himself says he's "fed up" with being president. One of many running jokes on the streets here in Cairo suggests that any day now he might just self-immolate in protest! Perhaps we could all calm down and review the symptoms before, next thing we know, the Haitians are being accused of financially backing this uprising! There is no room for compromise. Either the entire Mubarak edifice falls, or the uprising is betrayed. One cannot but note the "miraculous" nature of the events in Egypt: something has happened that few predicted, violating the experts' opinions, as if the uprising was not simply the result of social causes but the intervention of a mysterious agency that we can call, in a Platonic way, the eternal idea of freedom, justice and dignity. The uprising was universal: it was immediately possible for all of us around the world to identify with it, to recognise what it was about, without any need for cultural analysis of the features of Egyptian society. In contrast to Iran's Khomeini revolution (where leftists had to smuggle their message into the predominantly Islamist frame), here the frame is clearly that of a universal secular call for freedom and justice, so that the Muslim Brotherhood had to adopt the language of secular demands. Hosni Mubarak's exit plan: Where do exiled leaders go? With Egyptian President Hosni Mubarak appearing to be headed out of office, it’s likely he has thought about where he’d head next if he’s forced out of the country as well as the presidency. Ousted world leaders have a history of slipping away to other countries and living a life of relative anonymity and leisure in exile. If President Mubarak joins the ranks of those who fled their countries to live out the rest of their days elsewhere, where will he go? Some of his predecessors’ choices could give some guidance. With every passing day, the Egyptian uprising gathers strength as more citizens rally to the cause and demand the immediate resignation of Hosni Mubarak. The regime's pillars are crumbling. Yesterday, the demonstrators surged out of Tahrir Square and marched towards the National Assembly and the building that houses the Ministry of Interior. But perhaps the most important development was the smaller demonstrations held in front of government owned media outlets and the resignations of a number of prominent journalists on the regime’s payroll. Egyptian President Hosni Mubarak is expected to give a major speech any minute now and speculation is widespread that he may finally resign following weeks of protests. Mubarak was first supposed to speak at 1 p.m. Eastern time. Then 2 p.m. Then 3 p.m. It's 3:15 (10:15 p.m. in Egypt) and counting. Nothing like taking your grand ole time while Egypt and the world waits. Twitter is speculating why this is. Here are some of the best responses yet. Let us know of others you've seen! Earlier today Egypt's Supreme Council of the Armed Forces announced that it intends “to safeguard people and protect their interest” and it will stay in session throughout the ongoing crisis. The content and the title of the statement (“communiqué number 1”) suggest that we will hear more from the army in the coming days and that its leader may be calling the shots. Television footage of their meeting shows that Egypt's President and Commander-in-Chief Hosni Mubarak was not present in the room. Egyptian state television announced that Mubarak plans to give a LIVE address from the heliopolis presidential palace in Cairo. Is this Mubarak’s farewell address? Are 30 years of Mubarak over? This so-called stability encompasses millions of Arabs living under criminal regimes and evil tyrannies. After almost three weeks of intense street protests in Egypt demanding the removal of President Hosni Mubarak from power, more than 300 people were reported to have died in clashes between demonstrators, police and government supporters. Despite concessions such as Mubarak's pledge to not run in the presidential election scheduled for September and constitutional reform, the number of protesters in Tahrir Square in central Cairo swelled on Feb. 8. On that day, the crowd gave a hero's welcome to Wael Ghonim, a Google executive who had set up a Facebook page that many credit with inspiring the massive protests, after he was freed from 12 days in jail. The difference between Egypt today and Iran of the late 1970s is striking. There is virtually no chance that Egypt will take such a tragic turn should the revolution succeed. Here's something from Egypt to cheer you up at last. President Hosni Mubarak's speech writer enters his office in a tearing hurry with a piece of paper in his hand. 'Here you go, Mr President! Your final address to the nation.' “What happened?” asks a stunned Mubarak. “Are all Egyptians leaving the country?” The Egyptians are known throughout the Arab world for their zany, irrepressible sense of humor. So I am sure this, posted on a website frequented by fellow travelers of the Diaspora, must have originated in the land of pyramids and pharaohs. But seriously speaking, how ludicrously blasé and brazen can one get? After deliberately raising the hopes of millions of Egyptians and millions more around the world, U.S.-backed Egyptian President Hosni Mubarak defied the rising demand of the millions of protesters who have taken to Egypt's streets, to announce he will remain in office. Claiming he wouldn't bow to "foreign pressure," Mubarak, he said he had "laid down a vision...to exit the current crisis, and to realize the demands voiced by the youth and citizens...without violating the Constitution." For years my main reservation about the one-state/binational solution for Israel/Palestine was that realists said that even if democracy is the right thing, it would take years of bloodshed to get there. And I have given that argument weight. Did anyone think that Egypt could get as far as it has toward democracy so swiftly, and with so little bloodshed? Did any of these people on TV ever ever admit the possibility that politically-sophisticated Arabs could lead a revolution without slicing people's throats? NO. Let Egypt be a light unto the nations. Let us climb down from suspicion of other races. Let us imagine a peaceful transition to democracy in Egypt's neighbors too. The Beginning of a New Challenge for Egypt? "Egyptian Jokes about Hosni Mubarak"
The Interior Minister asks Hosni Mubarak to write a "Farewell Letter" to the Egyptian people. Mubarak replies: "Why? Where are they going?" When the news first broke that there were hundreds of thousands of anti-government demonstrators marching on Tahrir Square in Cairo demanding the resignation of Egyptian President Hosni Mubarak, I was thrilled. Did this mean that the type of popular revolt which had brought down the authoritarian government of Tunisia was spreading and might soon engulf other Arab countries in the Middle East and Northern Africa resulting in the collapse of authoritarian regimes such as those found in Algeria, Jordan, Libya, Morocco, Saudi Arabia, Syria, and Yemen? Were we witnessing the beginning of a new, more democratic world disorder? Nothing could be farther from the truth. In commenting on the unfolding Egyptian revolution, media and analysts have emphasised the role of social media in building up networks of dissidents and facilitating the organisation of protests. Some have credited the 'Facebook generation' with lighting the spark of collective action. Undoubtedly, social media activists, in calling for 'the day of anger', put the tools of virtual communication to remarkable use. However these 'days of anger' can only be understood if we look at what the vast majority of Egyptians have experienced over the last three decades under Mubarak's rule. Though all eyes are on Cairo and its Liberation Square, few could know that Egyptian workers have been protesting and striking in huge numbers for years. In a 2009 AFL-CIO report Stanford historian Joel Beinin wrote, "The current wave of protests is erupting from the largest social movement Egypt has witnessed in more than half a century. Over 1.7 million workers engaged in more than 1,900 strikes and other forms of protest from 2004 to 2008." Why Arab Democracy is Good for America, Maher Massis, Ph.D.
We are currently witnessing an unprecedented shift in Arab politics that has caught the whole world, even the Egyptians themselves by surprise. The uprising and it's epi-center Tahrir Square (Freedom Square) is the Arab world's version of the fall of the Berlin Wall. For many decades, the general Arab political discourse was defined by the West as the need to strengthen pro-Western dictatorships because of the fear of the alternative which is Iranian style Islamist regimes. Now, the Tahrir Square movement has clearly forced the West to rethink this perspective by showing that there is a third way -- the rise of broad based democratic movements that reject totalitarianism and extremism. We should not fear this change because its uncertain outcome, but rather embrace it and take an active role in encouraging democratic change throughout the Arab world. Iraqis’ demands may differ; however, their voice of anger is united. Demonstrators in Baghdad and mainly in Sadr City took to the streets on Thursday in denunciation to lack of services, unemployment and unfair apportionment. The public sector employees joined residents in their rally. London, Asharq Al-Awsat – Comments posted by Iraqis, both inside and outside of the country, on the social networking website "Facebook" in favor and support of the young Egyptians protesting in Cairo's Tahrir Square have now transformed into a call for Iraqi citizens to conduct peaceful demonstrations calling for improved government services, more security, and improved political and economic conditions. This comes as a knock-on effect from what is happening in Egypt, with regards to the protests against President Hosni Mubarak which have now entered their second week. The anti-Mubarak protests and demonstrations in Egypt are continuing strongly despite the fact that Mubarak has promised to implement the constitutional amendments demanded by the demonstrations and announced that he would be delegating the bulk of his presidential powers to his deputy, Vice President Omar Suleiman. Gaddafi ready for Libya's "Day of Rage"
Libyan leader Colonel Muammar Gaddafi has dealt with the calls being issued by the National Conference for the Libyan Opposition [NCLO] and Libyan [political] activists for a Libyan "Day of Rage" to take place on 17 February, modeled on similar events in Tunisia and Egypt, by issuing an unprecedented warnings against any attempts to create chaos and instability in Libya. Yahya sent me this: "Hi As'ad, I have this urgent news from Bahrain. It seems that Al-Jazeera is now banned in a number of hotels in Bahrain. I've asked for the reasons and some answers say that they have "recommendations" not to display the channel while others spoke to me that their managements are banning the channel due to high orders from the regime. However, Al-Arabiya is untouched." Using cabinet ministers as scapegoats, only to replace them with a nearly identical lineup, is a well-worn tactic in Jordan. Still, many people appear cautiously optimistic that political reforms are nearing.